Let me ask you a question: do you tend to decorate with traditional season-specific colors, or do you like to march to the beat of your own drum? In other words, do you use red and green at Christmas time, or do you like playing around with unexpected shades like bright pink, mint, and gold, for example? I ask because I’m feeling a little torn this fall when it comes to a decorative color palette. Earlier this month I gave you a tour of our fall-themed dining room, which was done in more of a traditional fall scheme of burnt orange, evergreen, and rich wood tones. When it came time to update our living room for autumn, though, I decided to steer a little differently. Scroll on to take a closer look at some of my favorite spots in our fall-time living room, and find out why I chose the colors I did. So, right off the bat you probably picked up on a lot of blue. It’s not exactly the most traditional color to use in décor this time of year, but I’ve always been so drawn to the look of jewel tones in fashion throughout the autumn months, and thought it might be kind of refreshing to bring that luxurious vibe into our main living space. 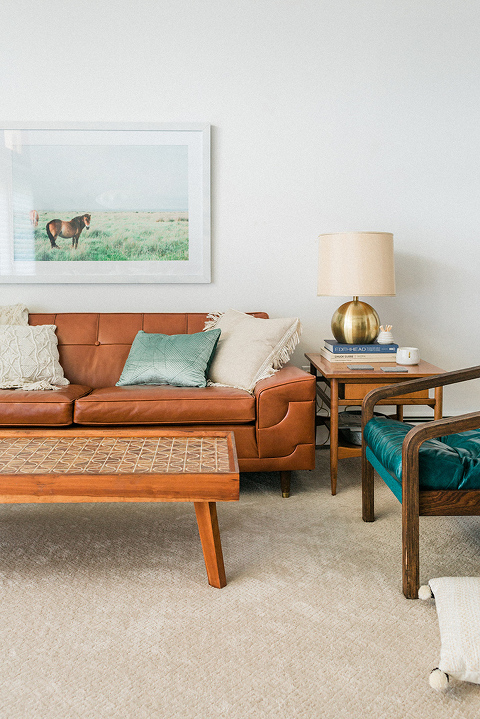 You’ll spot the color in a range of shades—from pale mint, to dark navy—which, I think, makes the room feel more multi-dimensional and unique than had we just used one range of blue. 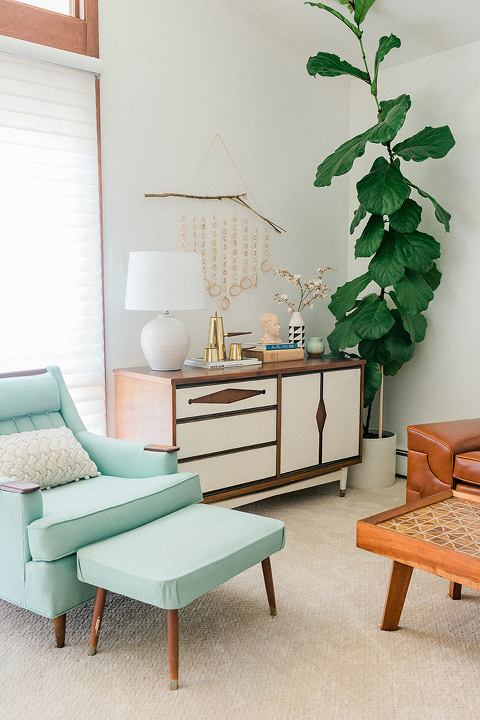 I brought both of our blue accent chairs into the room to establish that color foundation (they’re vintage finds we had recovered in new blue upholstery—one in Sunbrella fabric, and the other in leather), then I filled in with a couple other blue accessories. Like in our fall dining room, it didn’t take much to make this space feel colorful. Remember how I added just two or three orange accents to our fall-time dining room in order to get the point across? Well, here in the living room, all I needed to make the space pop with jewel-toned pizazz was the pair of blue chairs, two new blue throw pillows, and a couple of blue coffee table books. That’s it! The rest of the room is made up of the wood furniture we already had, some neutral accents, and a large-scale art print up on the wall that features a blue background. It really just goes to show that you don’t need to go overboard with 10-15 pieces in your chosen fall color. A few colorful accents scattered throughout a room makes a seasonal statement without feeling oversaturated. Did you notice our new window coverings?! We finally upgraded the old dingy sheer panels that came with the house to new custom cellular shades from Levolor. I actually wrote a full story in collaboration with the brand over on eHow’s website that you can read here, which explains it all. In the piece, I also talk about a few easy upgrades you can make to lighten and brighten any living space starting, of course, with light-filtering shades. These puppies are no joke. They completely transformed the look of our combination dining-and-living room. I think they look a little Japanese (kind of like Shoji Screens! ), and really amplify the natural sunlight that we get in this front portion of the house while still offering lots of privacy, too. You’ll see a GIF animation below that demonstrates the difference the shades make when left up and when they’re pulled down. One other tip I’ll leave you with in case you’re interested in playing around with a jewel-tone-inspired fall palette is to play up metallics. I splurged on a new gold and marble side table to place in front of the windows by the upholstered arm chair (chosen because the thin gold base didn’t block the new shades or natural light! 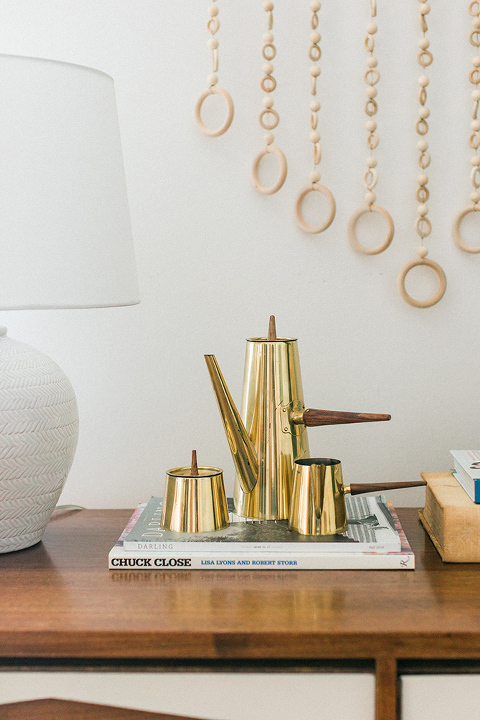 ), and then I pulled out a metallic pitcher set, a gold lamp, and brass tray that we already had to decorate the rest of the room. I’m of the mind that nothing says “luxurious fall” quite like shimmering gold, and the good news is that these types of metallic accents transition seamlessly into holiday and winter décor, so you’re almost killing two to-dos with one stone. I know this color palette is a little out of the box for fall, so if it’s not your cup of tea, that’s okay! 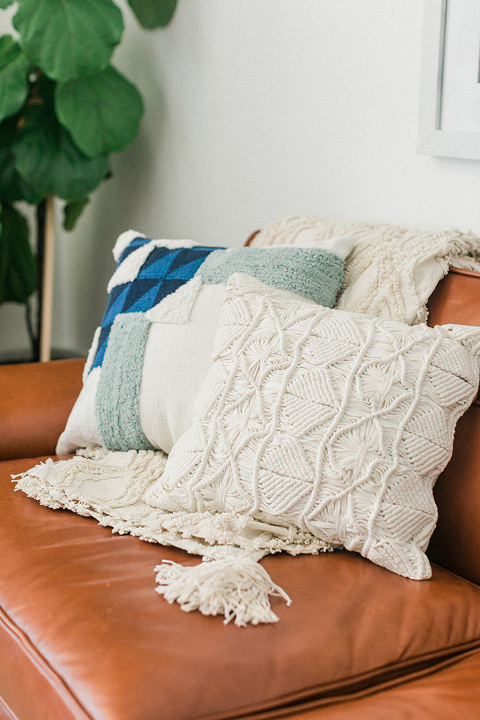 If you’d prefer to call our mini living room update a winter refresh, by all means, feel free to do just that and use it to inspire your décor for next season. At any rate, we’re loving the little room refresh, and I hope you’ll hop over to eHow next to read my tips for lightening and brightening your own living space (for any season!) here.